Last night was the Coronation Night for Miss Cebu 2012 at the Pacific Grand Ballroom of Waterfront Cebu City Hotel and Casino. Miss Cebu 2012 Pierre Anther G. Infante, 1st runner-up Rachel Chloe T. Palang, 2nd runner-up Ella Beverly P. Sarmago, 3rd runner-up Jonnie Rose Louise R. Wee and 4th runner-up Herlie Kim T. Artugue. 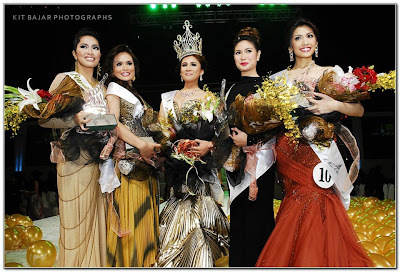 0 comments: on "Miss Cebu 2012 Winners and Special Awards"